We have now expanded into a third unit giving us over 13,000 sq.ft. of factory & office area. We now offer a glass bead blasting & chemical brightening service on aluminium parts. Please see our contacts page for our new email addresses to better direct your enquiries. We offer the capacity to treat small to medium sized components in typical batch sizes from 1 to 50,000 units. Our maximum dimensions for sulphuric acid and chromic acid anodising are 2430mm (96 inches) by 760mm (30 inches) by 760mm (30 inches). However these dimensions reduce for dyed components and other finishes. We are happy to quote for all work and offer a free sample coating service to demonstrate our capability. If you have an interest feel free to contact us. 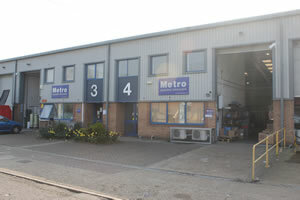 Metro Plating is a family run finishing company based in Uxbridge, Middlesex, specialising in treatments on aluminium. Established in 1946, we are now in our 65th year of providing a quality service to industry. We offer high capacity rapid turnaround anodising and chromate conversion finishes to industry, with particular emphasis on the aerospace, motorsport, marine and medical sectors. Since 2010 we have expanded our privately owned purpose built factory to over 9,000 square feet in Uxbridge. Our standard lead time is 2 to 3 working days but we offer premium rate “Fast-track” and “Super-track” services to bring lead times down to 2-6 hours, depending on the finish required. Our facility operates 24 hours a day and is usually open continuously from 7.00am Monday to 1.00pm Friday each week. We also offer a free delivery and collection service in a wide-ranging area around Uxbridge. Our current workforce has over 200 years combined experience in the metal finishing industry, enabling us to provide the highest quality service and expert advice on technical queries relating to the treatment of aluminium. Our modern fleet of Volkswagen vans operates across the South East of England making collections and deliveries free of charge within set delivery routes on particular days. If you would like to be included on our route, please call us to discuss this. See a map of our delivery catchment here.